Here is a take on a classic Bourbon Sour. This is a bourbon-lover’s drink with a twist. This richly flavored dark amber syrup made from maple syrup, the sap that flows from maple trees in the Northeastern United States and parts of Canada, doesn’t so much weaken this drink’s potency as it does deepen it — the straightforward sweetness of white sugar is replaced with the darker, more complex sweetness of maple syrup, which you might say is the bourbon of sweeteners. This is a perfect drink to mix for guests after dinner on a chilly, snowy evening. 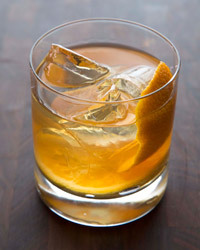 In a rocks glass, combine the maple syrup with the orange juice, lemon juice and bitters. Add the orange wheel and lightly muddle. Fill the glass with ice and top with the chilled seltzer.